On February 15, 2017, Diana Wortham Theatre announced its public campaign, The Next Stage, to raise the final $300,000 of its $3.1 million capital campaign goal to transform into a facility with three distinct performance venues. • Multi-use for classes, events, etc. Active day and night, this center for the performing arts will bring artists, students and audiences together in a supportive environment to experience, learn and celebrate creative expression through performance. Current Associate Director Rae Geoffrey, who will lead the theatre as its new Managing Director effective July 1, 2017 following John Ellis’s retirement this summer, invites the community to visualize exactly what The Next Stage will mean upon completion. 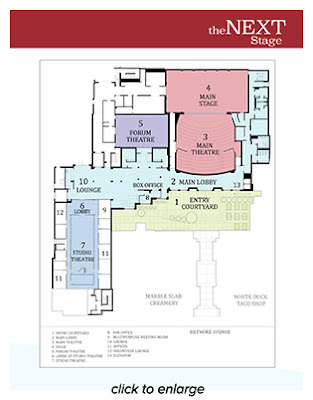 “Imagine entering the newly expanded center for the performing arts through its redesigned courtyard entrance and lobby. On a given evening there could be three very different events, in the three different venues, at different price points and for different audiences: from dance performances to innovative new theatre works to intimate chamber or jazz ensembles to community workshops and classes, all under one roof,” says Geoffrey. Though already serving approximately 10,000 children each year, completion of The Next Stage campaign will allow the theatre to increase the total number of events for children and families by 250% to 75 events and increase total audience attendance by 60% to more than 80,000 patrons of all ages. For more information or to make a donation or pledge to The Next Stage, contact the theatre’s Resource Development Director, Kathy Jackson at 828-210-9849 or kathy@dwtheatre.com.